This SUNDAY! 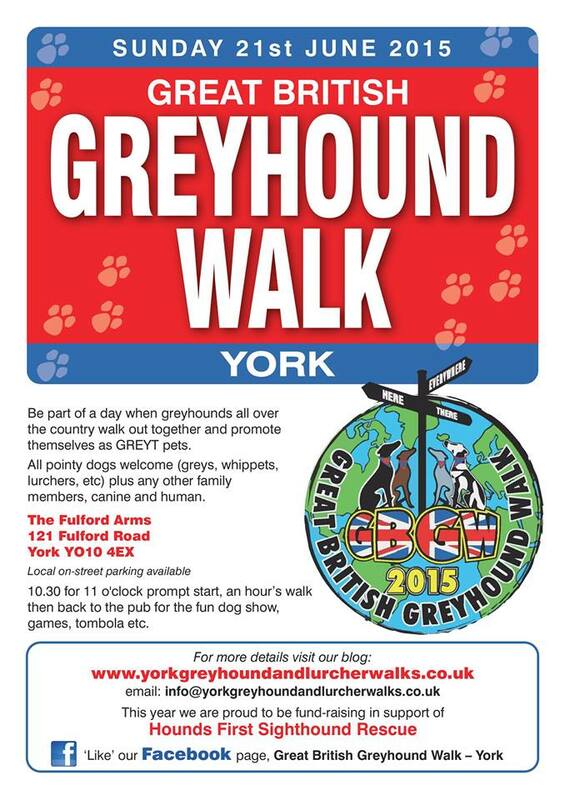 The Great British Greyhound Walk- York with a fun dog show. 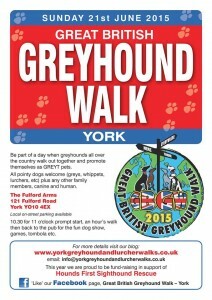 Raising money for Hounds First Sighthound Rescue. Duration: 45 mins – 1 hour for the walk, plus an hour or two afterwards for the fund-raising (including Fun Dog Show, raffle and sales of handmade stuff). The pub will be open too, so plenty of opportunity for a beer/lemonade afterwards. Parking: Parking available on surrounding streets (see map below). Please allow time for this as you may have a couple of minutes stroll to the pub. Please don’t plan to park in the pub car park as we have to reserve space for stalls, hounds and access! (Disabled badge holders can contact us and we will reserve a space for you).